Director Mark Forster presents a daring and eagerly awaited film adaptation of Khaled Hosseini‘s best-selling novel, The Kite Runner. Initially set in Afghanistan during the sixties, amid political and military turmoil, The Kite Runner is an unforgettable story about loyalty and redemption, and a powerful exploration of father-son relationships. The story begins with a young boy named Amir and his best friend – and the son of his servant – Hassan. 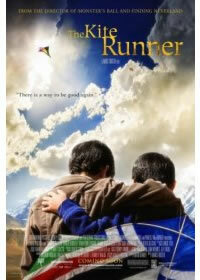 Amir struggles to succeed in his father‘s eyes and sets out to win his father‘s affection by competing in a kite-running tournament, in which participants with honed kite-battle skills seek to eliminate their foes by maneuvering their own kites – which have special strings, often even coated with glass – to slash the strings of others. When Amir wins and his kite is the last in the sky, Hassan goes to retrieve the final downed kite as a trophy for his friend; however, tragedy ensues, setting off a chain reaction of life-changing events for both boys.